It is, without a doubt, one of the most story-centric pieces in Magic, and so much of the Tarkir block revolves around it that we can't help but poke at the art description and see what falls out (and if you haven't already, read the story of the battle by Doug Beyer). First, let's set the scene. Location: Over Ugin's future tomb. This location is the past version of a location that has already been shown. The one key element to connect the two locations is the uniquely shaped rock. This uniquely shaped rock should be in the foreground. It is the vantage from which Sarkhan crouches and watches this epic battle. The location that has already been shown? Well that doesn't bode well for a certain Spirit Dragon. Spoilers much? So what, pray tell, leads up to that moment? 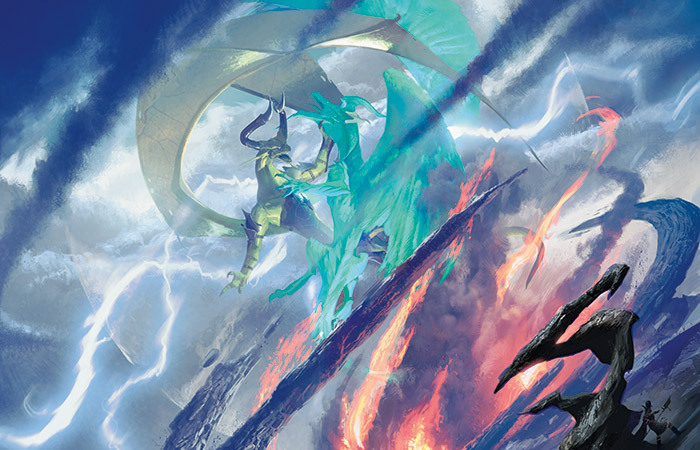 Action: Show the epic dragon Planeswalkers Ugin and Nicol Bolas fighting in the air over Tarkir. Tremendous amounts of magical energy are being released as these two clash in a fight of mythic proportions. Shockwaves have cracked the earth below and created a clear circle of sky within the scattered clouds around them. At this point both Bolas and Ugin are "pre-mending" Planeswalkers…they are basically gods in command of unlimited power. The realization of this fight should be so epic in scale that it implies a mortal could barely comprehend it. Focus: The battle between two super-powered dragons. Mood: Mind blowing fight of epic scale. Did you catch that? That one little line that Doug's story hinted at but never came out and said. At this point both Bolas and Ugin are "pre-mending" Planeswalkers…they are basically gods in command of unlimited power. For those of you who weren't playing during Time Spiral, the mending was an event that affected the entire Multiverse and changed what it meant to be a Planeswalker. Prior to the Mending, Planeswalkers were, as the art description says, basically gods, with virtually unlimited magic at their fingertips (or claw tips, in this case). That also meant that they were capable of wreaking incredible destruction, and often did so when they dueled. Many places were laid waste by careless pre-Mending Planeswalkers. 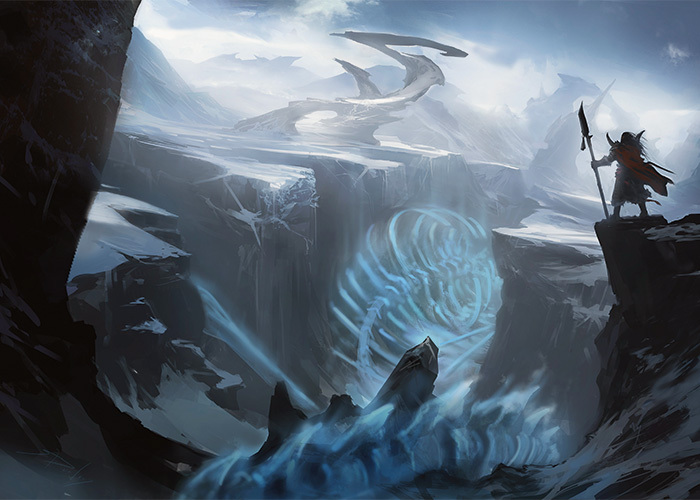 After the events of the Time Spiral block, Planeswalkers retained the ability to move between worlds, but became something closer to powerful mages than out and out, all-powerful beings. Planeswalkers who survived through the Mending and retained their sparks transitioned to this new type of Planeswalker (like Karn or Nicol Bolas). And that, as you now know, is how the battle between these two iconic Planeswalkers played out.